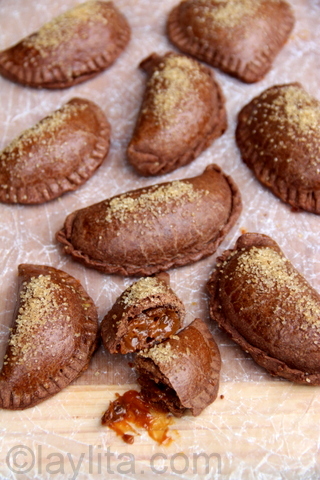 These chocolate dulce de leche empanadas are made with a homemade chocolate empanada dough and filled with creamy dulce de leche or caramel. Dulce de leche is very popular in our house, sometimes we make it home from scratch, other times we buy it at the store; regardless it doesn’t last long around here. Empanadas are also another very popular food in our home. 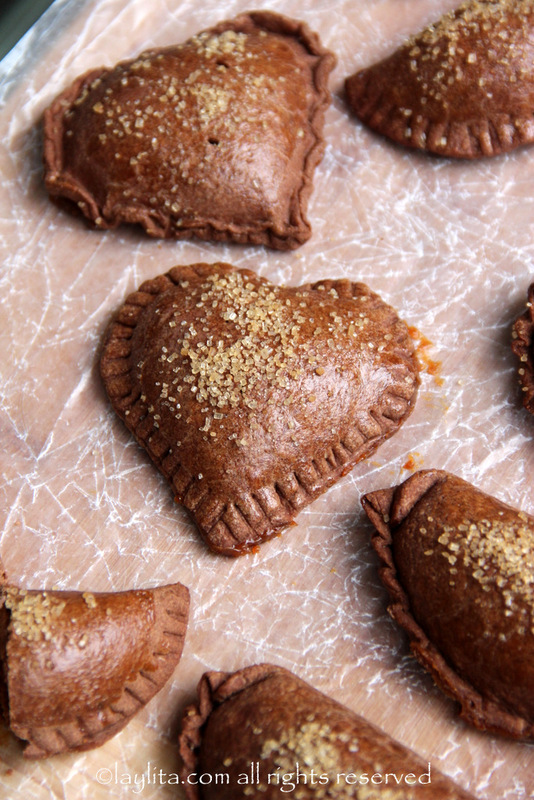 I wanted to combine these two favorites into one, but I also happen to love the taste of chocolate + dulce de leche so wanted to try making a chocolate empanada dough instead of the standard sweet empanada dough. I was a little bit concerned that adding cocoa powder to the dough would make it very fragile and hard to handle, however it worked out fine and tasted great when baked. 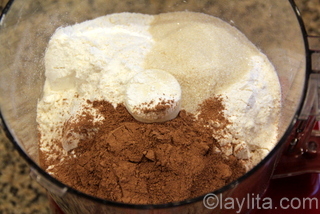 Place all the dry ingredients: flour, sugar, cocoa powder, cinnamon powder and salt in a food processor and mix well. Add the butter pieces and pulse until mixed. 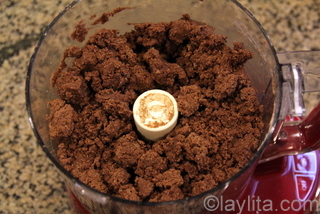 Add the eggs and 4 tablespoons of water/milk/coffee, mix until a clumpy dough forms. Add the additional liquid one tablespoon at a time if needed. 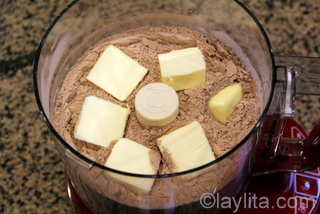 Remove the chocolate dough from the food processor and knead it a couple of times. 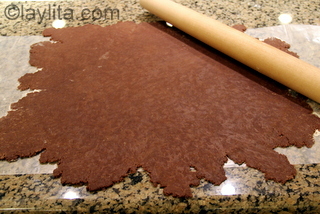 On a lightly floured surface, use a rolling pin to roll out the dough into a thin sheet. 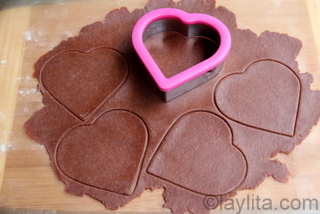 Cut out round disc shapes for empanadas, use a round dough cutter as a mold. 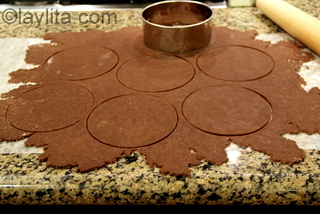 If you don’t have a dough cutter you can also use a small plate or cup and then use a knife to gently cut around. You can also you other shapes (hearts, etc). Choose how large based on whether you want small or medium sized empanadas. 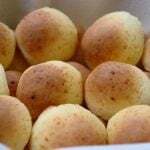 Use the empanada discs immediately or store in the refrigerator until ready to use. You can also layer them with wax paper and freeze to use later. 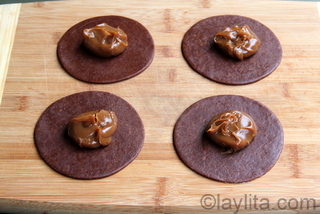 Place a spoonful of the dulce de leche on the center of the empanada disc. Fold the empanada discs and seal the edges gently with your fingers, then use the tip of a fork to further seal the edges. You can also try to make a repulgue or churito which means to twist and fold the edges gently with your fingers, however sweet empanada dough is more fragile than savory empanada dough and it’s much easier to use a fork to seal the edges. 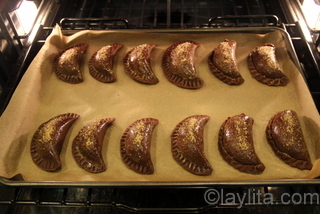 Lightly brush the top of the empanadas with the egg wash; this will give them a nice golden glow when baked. 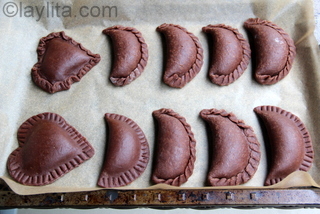 Bake the empanadas in a pre-heated oven at 375 F for 15-20 minutes. The exact time will vary based on your oven and size of the empanadas. 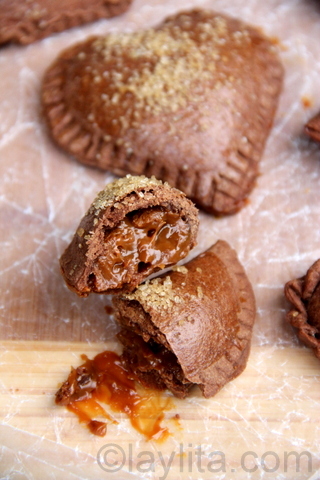 Serve the dulce de leche empanadas warm. They are still good served cold, but taste much better when eaten warm. You can sprinkle them with a little bit of cocoa powder and I highly recommend serving them with a scoop of vanilla ice-cream. 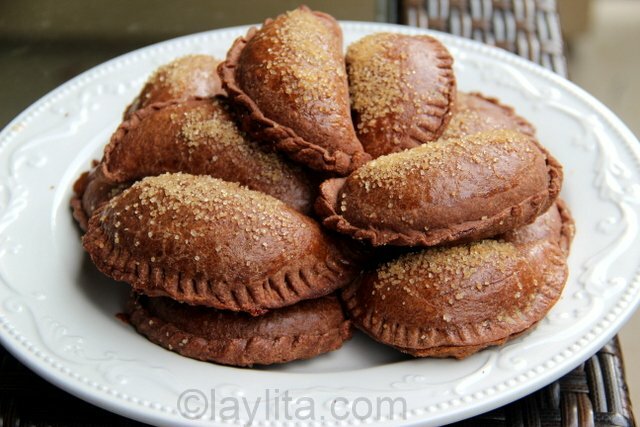 In general, sweet empanada dough is more fragile than savory dough because of the addition of sugar, but it just needs a little extra care and it works great – plus, for any type of sweet dessert empanadas it is completely worth it to make your own homemade sweet dough. The taste is so much better than the store bought savory discs – which I do like for savory fillings, but not so much for sweet ones. 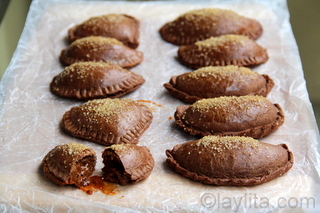 There is high chance that these chocolate dulce de leche empanadas will leak out some of the caramel when baking. Most of it does stay inside in the empanada and all you need to do is just wait for them cool down enough to be safe to handle and scoop the leaked dulce de leche from around them. I tried making a couple of small cuts in the top of them, it still leaks out, but it at least leaks over the empanada. I also noticed that the empanadas that were sealed with a fork were more likely to leak than those were sealed using a manual twist and fold repulgue technique. If you love the taste of chocolate and cinnamon you can optionally add a little bit of cinnamon powder to the empanada dough. 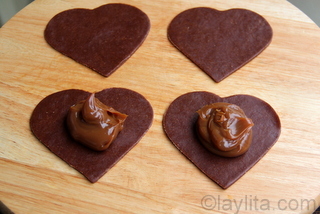 Also, if you are a fan of the salted caramel flavor you can add a sprinkle of sea salt to the dulce de leche filling. These empanadas are very rich and sweet, so I do prefer to make them on the smaller to medium size, but you can adjust based on your preference. They go really well served with a scoop of vanilla ice cream or vanilla frozen yogurt. 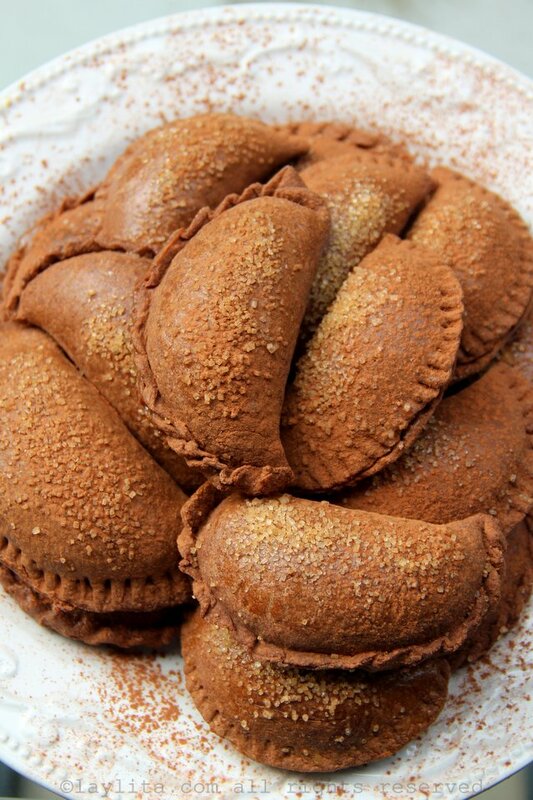 ¡Sus chocolate dulce de leche empanadas eran muy bueno y delicious! El dulce de leche dentro de las empanadas de chocolate era una gran idea. 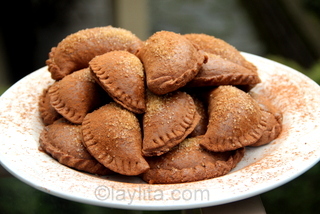 Las empanadas eran muy dulce. Mi class de espanol amaba las empanadas. Me encantaria hacer las empanadas de nuevo en algun momento. Hi! I’m just curious… I’ve also read your dough recipe for the fried version. Can this recipe be fried as well? 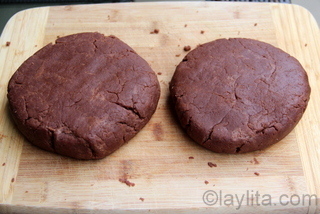 I haven’t tried to fry this chocolate dough, if you do let me know how it goes. I just made these . Fork method before I read your notes.. Leaked out. But, I made fresh cream, added some dolce to the top, they were stil yummy! I followed the recipe step by step but mine leaked too. Very frustrated. I served them with vanilla ice cream and a dollop of dulce de leche on top. Problem solved. Can I make the dough manual? I have neither a food processor nor a mixer. Yes – just make it by hand as you would make dough for pie or a tart crust. 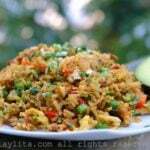 This looks devine, I think I will make it with a little bit of almonds.